It’s time again for Mixology Monday. This months theme, Witches’ Garden, comes from Mark Holmes at Cardiff Cocktails. It’s an herbal theme that we’re very excited about. We have lots of herbs in the garden right now, in the form of sage, thyme, rosemary, parsley, and chives. In the end we decided to try something with garlic chives, which are tasty and we didn’t think they’d get much play. Plus chive flowers are all fluffy purple and festive. Muddle the garlic chives, add everything else. Stir for a couple minutes to let the chives macerate. Stir with ice and double strain. Garnish with a chive flower. Nose: Gin (lavender, juniper), chives, vegetal notes from the hot peppers. Palate: Floral and juniper flavors from the gin on the open along with a hint of lemon, followed closely by the chives. Moves into green notes from the nettles on the mid-palate with a big hit of heat from the chiles. Garlic and slight tanginess from the lemon on the finish. Well integrated. This makes a great martini alternative for those who like things a little spicier. 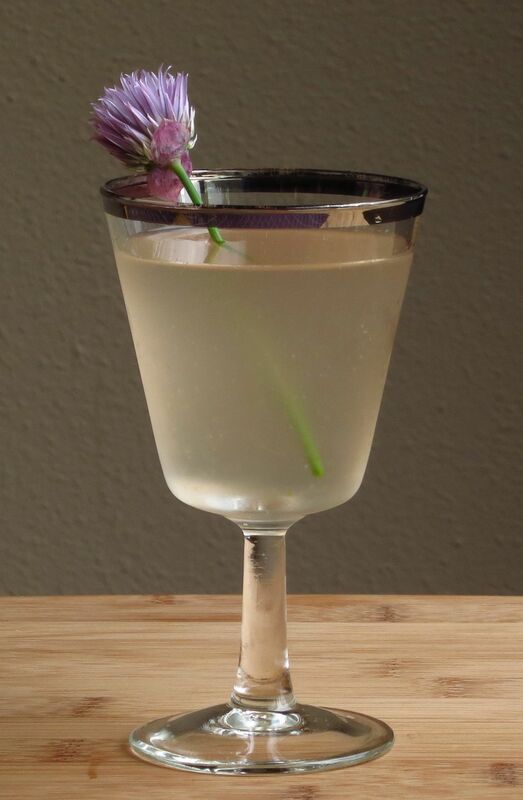 We named it because it looks cool and elegant, and on first sip you get the more delicate flavors of the gin, but it is hiding brash chile and allium flavors just under it’s deceptively simple surface. Unexpected! But really delicious. And you don’t even need to duck into a phone booth (presuming that you could even find one anymore :)) to enjoy one. Update: Head on over to the roundup. Lots of great drinks as always. This entry was posted in gin, Mixology Monday, Original Cocktail, vodka and tagged clark kent cocktail recipe, martini alternatives, new deal hot monkey vodka, spy hop gin. Bookmark the permalink.